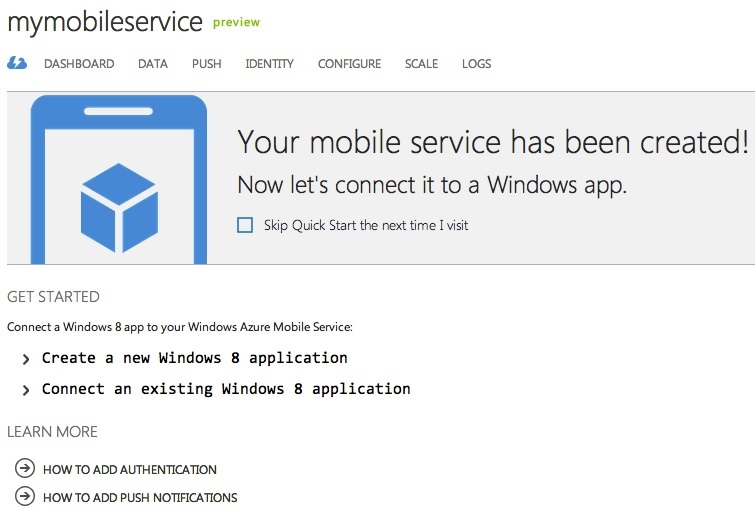 Update 10-16-2012 We've now released native iOS SDK for Windows Azure Mobile Services. You can read more about it here. 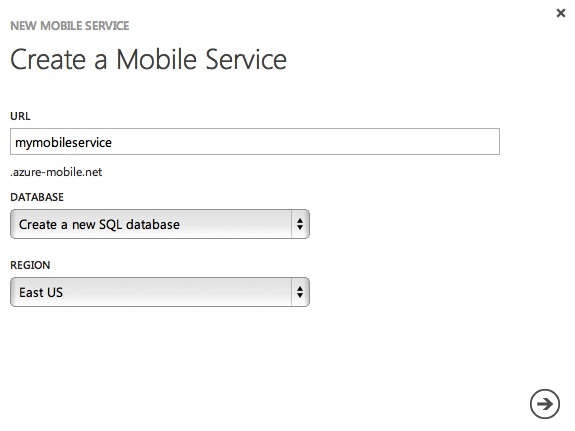 As mentioned yesterday by me, and half the internet, Windows Azure Mobile Services has been launched. 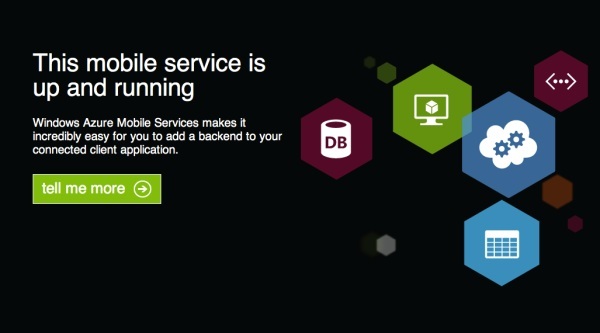 Already people have started talking about how fast and easy it is to use Mobile Services as a backend. One thing that I highlighted and that others have pointed out is that official support for iOS, Android, and Windows Phone 8 is coming. This means that if you want to download and install pre-built REST helper methods for your non-Windows 8 operating system, you’ll have to wait. However, since all of the calls to Mobile Services are being done over HTTP and are REST based, it’s pretty easy to see what each call sends over the wire. This means that we can take that information and write our own code that will run on iOS and Android and hit Mobile Services. Today, I’ll start to show you how to do just that. In this article, we’ll walk through creating a new Mobile Service and then connecting an iOS client to it. We’ll only use some basic data capabilities provided by Mobile Services but in the coming weeks, I’ll show you how to watch the HTTP calls made by a Windows 8 app (so you can figure out what’s going across the wire) and then how to reproduce some of the more advanced things in both iOS and Android. By the end of this walkthrough, we’ll have reproduced in an iOS client, all of the capabilities of the initial Todos Windows 8 Mobile Services demo. You’ll be able to add new todos, list those todos, and mark todos complete. Let’s get started. If you want to dive into the source code without going through the whole tutorial, you can access the source code on GitHub. 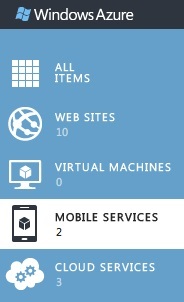 In order to create a Mobile Service, you first need to have a Windows Azure account. You can sign for a free trial here. This free trial is good for three months of access. Once you’ve done that, log into your account, and go to the Account Center. From there, access the preview features area of the site. There you’ll see a button to “try it now”. 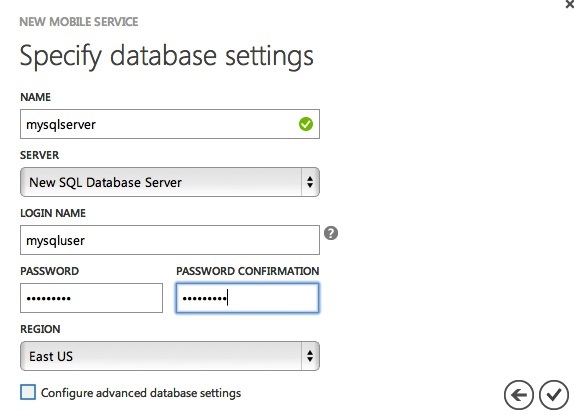 You’ll then be able to specify database settings. If you’ve already created one mobile service and a SQL Database Server, you won’t be able to create a new one. You can create a new SQL database but you will be limited to a single server (under the free preview mode at least). So if this is your first time through this, create a new SQL Database server, and if not, either use your existing database, or create a new SQL database. Now, you can’t change that page but remember that the mobile service endpoint is just an endpoint. It’s not meant to also serve up a web page that you can change. Going back to the portal, click on the site (where it says “mymobileservice” in the image above the web page) and you’ll go to the dashboard for your service. The dashboard will let you know that your site is created and give you some instructions to get started. When that’s done, click the checkmark and the table should show up under your list of tables. We only have one thing left to do and that is get our app key. In the links at the top of the portal, go to “Dashboard”. 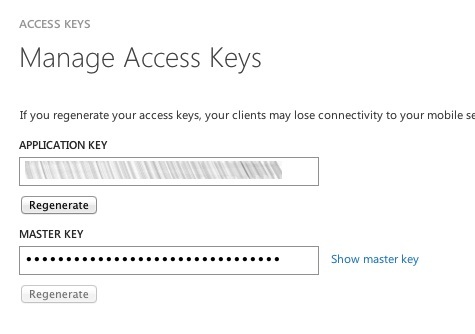 At the bottom, you’ll see a button to “Manage Keys”. Go ahead and click on that. 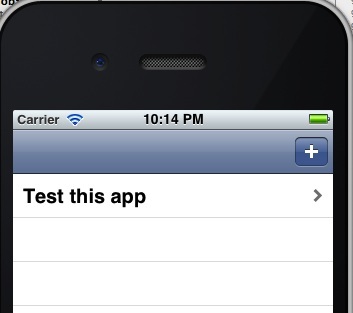 In the modal that pops open, you’ll see the “Application Key”. Copy that value down for later. That’s all you need to do on the server side. Now we can start working on the good stuff! If you have a computer running Windows 8 as well, I would suggest following the instructions for creating “a new Windows 8 application” seen above. We’ve already created the table, but following those steps will enable you to download a Visual Studio solution that is 100% ready to run and you can see how the basic todos app runs. It’s not necessary for proceeding with the iOS client, but it means that you can already have a few todos in your database. Either way, we can proceed to the iOS client now. Start up Xcode and create a new project. For this demo, we’ll just create a Single View Application. You can name your project whatever you want (I’ve named mine, “mymobileservice”). Start by going into the MainStoryboard.storyboard. 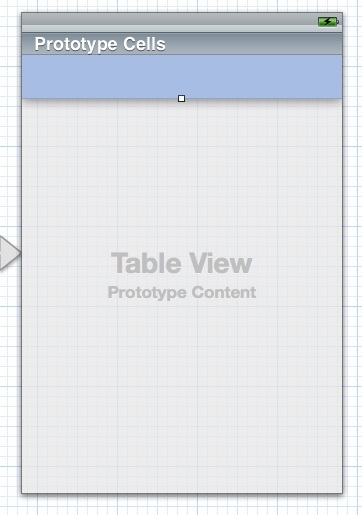 You should see the default storyboard with a single view controller. We’ll name our outlet “tableView”. Now, close the assistant editor and control click and drag on the table view again, but this time go to the View Controller inside of the View Controller Scene and let go. You’ll want to replace “yoursubdomain” with the URL you’ve set up for your site and the app ID with the key you pulled out of the Manage Keys modal earlier on. Let’s stop for a second and take a look at these URLs. This is our first insight into how Mobile Services works. kGetAllUrl has at the end /tables/TodoItem which corresponds to the TodoItem table we created earlier. After there is a query string parameter to specify a filter. Here, we’re telling it to only pull back todo items which have a complete flag of false. If we dropped the filter, we’d get back all the todo items. kAddUrl and kUpdateUrl are the nearly the same, however, the update url has the slash at the end. The reason for this is that when we create, we just need to specify which table we’re going to create something in. If we update, we need to include the ID of the item we’re updating in the query (after the slash). Now, we can switch over to the ViewController.m file and make some magic happen. The first method we need to change is viewDidLoad. Here, we’ll just call another method that will handle loading our todos. The only thing really interesting here is that we’re sending over the application key as a header named X-ZUMO-APPLICATION. If you don’t send this to Mobile Services (code named Zumo prior to launch) then you’ll receive back a 401 unauthorized error from the server. The next set of methods we need to implement are those required by implementing the NSURLConnectionDelegate delegate. First, let’s jump over to AppDelegate.h and add a property to keep track of our todos. Here, we’ve added a NSArray property to store our todos. In the AppDelegate.m we just need to synthesize that property. Now let’s hop back over to ViewConnection.m and add the NSURLConnectionDelegate methods. The first few methods (didReceiveResponse, didReceiveData, and didFailWithError), don’t really do anything special (in comparison with any other call to NSURLConnection). In connectionDidFinishLoading we actually do something with the data that we’re pulling back. Specifically, we use NSJSONSerialization to deserialize the data into a NSArray. We then get a reference to the AppDelegate and set the previously created todos property to be equal to the array we pulled back. Finally, we tell the tableview to reload it’s data. 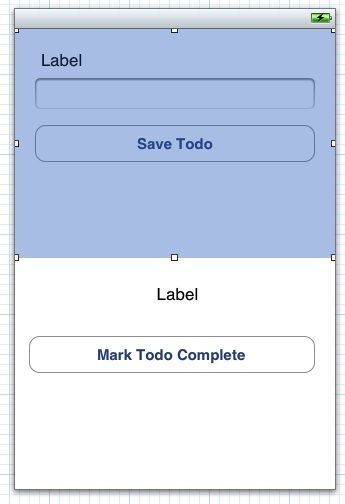 Our last step, for displaying the todos, is to implement the UITableViewDataSource and UITableViewDelegate methods. These methods are called when we reload the tableview. Note that the top half and bottom half both have a View on them. We’ll hide or show each view depending on if we’re looking at the details of a todo or if we’re adding a new one. On the top half (for adding a new todo) we have a label just to display some information (like “Todo Text”), a text field for entering the todo’s text, and a button for saving the todo. In the second half (for viewing details) we have a label for displaying the todo text and a button for marking the todo complete. Before you can open the Assistant Editor, you need to connect this with the TodoDetailsViewController we created a moment ago. Select the view in the storyboard editor and open the Identity Inspector, select the drop down for class and choose TodoDetailsViewController. Next, we’ll add some code to the viewDidLoad method. Here, we’ll check to see if we’re adding a new todo or looking at an existing one. Depending on which one it is, we’ll hide one of our subviews. If we’re looking at an existing todo, we’ll look up the todo ID and set the text in the label. This is very similar to what we did in the tapSaveTodo method. The only two differences are that when we generate the URL, we are putting the Todo ID at the end of it, and we’re setting the complete flag to be true when we put it in JSON. When this call to NSURLConnection is complete, it calls the same NSUrlConnectionDelegate methods we already generated. 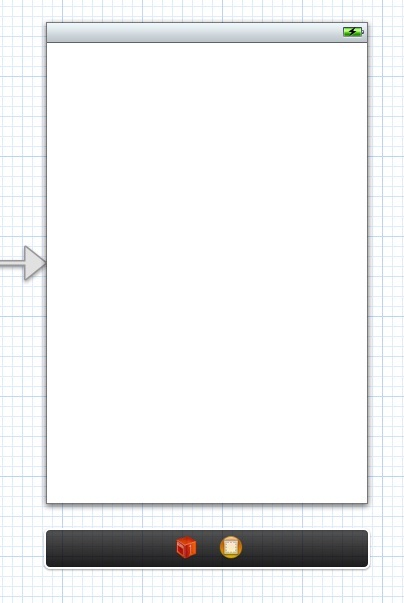 Now we’re ready to wire this view controller up in the storyboard so open up MainStoryboard.storyboard. Select the initial view controller and go to the Editor menu, choose Embed In, and select Navigation Controller. Here we’re going to generate two segues from the first view controller and the TodoDetailsViewController. 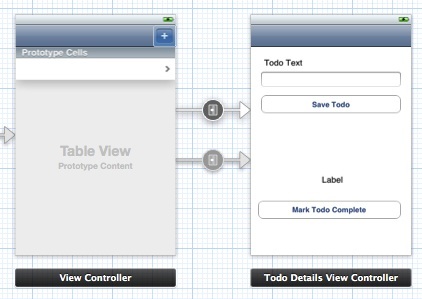 Zoom in on the first view controller and select the cell in the table view. Control + Click and drag over to the second view controller. When given the option to select a segue, choose Push. Next, go to ViewController.m and add the following code to the bottom of your class to define the didFinishWithTodo method. Now if you run your application and hit the plus in the navigation bar, you should be able to add a new todo. When you do, it should take you back to your list. If you tap on a todo, you should be taken to the screen where you can mark it complete. After doing so, you should return to the tableview and have that todo removed. 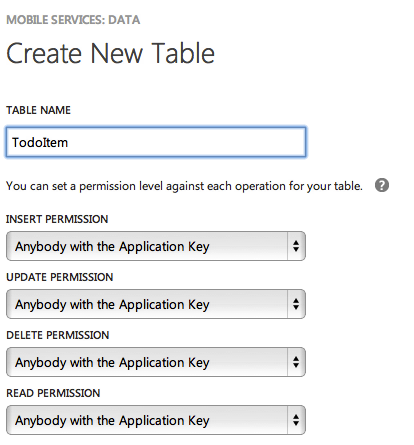 We’ve just duplicated all of the initial data capabilities of the Todos Mobile Services tutorial. You can access the source code from this walk through on GitHub. Just remember that after you’ve pulled it down, you’ll need to change a few things in the Constants.m file. Specifically, you need to enter your subdomain in the three URLs and your app ID in the fourth constant. While official support for anything except Windows 8 is coming, you don’t have to wait to make use of Windows Azure Mobile Services. As seen here, the Mobile Services end points are just looking for data to come across in JSON format and only expect you to send over a single additional header (X-ZUMO-APPLICATION). Today we’ve only looked at a small piece of what you can do with data, as there is much more. I’ll tackle some of those more advanced things in the coming weeks. I’ll also go through how to inspect the HTTP traffic going across the wire from a Windows 8 app so you can see what’s going and how to call into Mobile Services. As a reminder, if you’re looking to test out Mobile Services, sign up for a free Windows Azure account here. Thanks Mark. I'm planning on revamping how the site appears on mobile devices soon. Sorry for the inconvenience until then. Hi Chris thanks a lot for the tutorial. When the full support for iOS and Android arrives will be awesome. When and where could I find a photo upload example that works in WAMobile Services and iOS ? There is any possibility that you could provide us with a such example ? Hi Lorenço, I definitely agree that full support, when it comes, will be awesome! So that I understand your scenario, are you wanting to store the photo in the WAMS database and then pull it down whenever you do a GET on that table? Hi Chris, thanks for the post. Is there a way to join tables using mobile services? It seems at the moment the only way to really do this is on the client, which isn't really ideal when dealing with mobile phones. I see that the CRUD operations can be modified, but that isn't really the same thing. It's not terribly straight forward, but have a look at this post under the "Relationship on the server" heading: http://blogs.msdn.com/b/car.... In short, you can do it, you just have to manually do a few things on the client and server. Or do I have to use another different structure to delete a row? Thanks Chris for your help, your answer solve my problem. No problem. Happy to hear it.